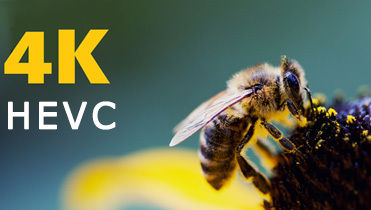 What is 4K HEVC & How to Play It on Mac/Windows, and 4K TVs? 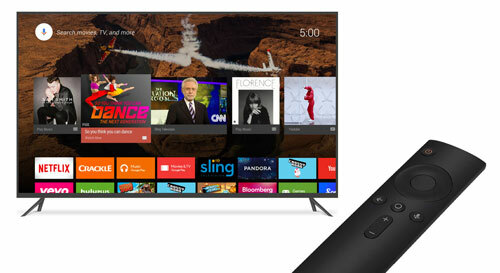 4K is the next big thing in TVs, and 4K videos are sprouting everywhere. But 4K video takes up tons of storage space, which makes it hard to download in best quality possible and save it in devices with small capacity of storage. Nevertheless, a new technology - HEVC, aka H.265 appeared, giving you the same brilliant image but smaller size for 4K videos. 4K HEVC is 4K UHD video encoded with HEVC codec, which outputs significantly better visual quality than an AVC file of equivalent size or bit rate. To put that another way, 4K H265 enables a video to be compressed into a file of half size, or half the bit rate of H.264, but in same high quality. It's take a while for 4K HEVC to be ubiquitous, but it's happening - 4K Blu-rays are encoded in HEVC, MacOS High Sierra has wide compatibility of HEVC, software like MacX Video Converter Pro 6.3.0, VLC 3.0 makes HEVC and 4K videos more watchable on your desktop, and the iPhone based on iOS 11 can shoot 4K videos in HEVC to save more storage space. But precisely owing to 4K H265 is on the half way, the video compatibility may stop you from playing 4K HEVC on TVs, desktops or mobiles freely. Thus this article will show you the advantages and disadvantages of 4K video in HEVC codec, give you a reference for the minimum hardware for 4K x265 playback on Mac and Windows and guide you how to play 4K HEVC, even at 60fps on TVs. 4K Ultra HD (UHD) provides four times the pixel resolution of HDTV with 60Hz frame rate for smooth motion and 10-bit colour for a stunningly realistic viewing experience with striking visual details. And compared with H.264 codec 4K videos, the HEVC 4K takes up less, approximately 50% storage space, which means only half data are needed when streaming or downloading 4K videos in HEVC codec. In opposite terms, 4K HEVC is not as widely compatible as 4K H.264, the overwhelming majority of old desktops and mobiles don't support 4K HEVC codec at all. Besides, HEVC is slow without hardware accelerated decoding. Thus 4K videos choppy or stuttering happens frequently when playing on Mac/Windows without hardware acceleration decoding support. Though you can have a better experience for watching 4K H265 on 4K TVs or monitors, more users are trying to watch 4K UHD HEVC videos on Mac or Windows desktops. But to be frank, no computer has a big enough monitor for 4K UHD video playback except the new 4K Retina 21.5-inch iMac and the 5K Retina 27 inch iMac. Even if you're able to play 4K video on Mac and Windows computer, the video itself has been downscaled in the background. No to mention that sometimes your hardware configuration is not powerful enough to run 4K HEVC videos. You also need to use a operating system and 4K video player that supports not just HEVC video, but also HEVC hardware decoding. And this is a bit spotty at the moment. Many players are still adding support for HEVC hardware decoding, and in some cases it may only work with certain chips from the list above. As far as I know, VLC 3.0, 5KPlayer, Plex Media Server 1.10 support HEVC hardware decoding indeed right now. But if your computer is not equipped with qualified hardware, operating system and media player for 4K x265 playback, you can process 4K video from HEVC to AVC/H.264 with MacX Video Converter Pro, a 4K HEVC video converter which is able to transcode 4K HEVC to H.264, VP9, MP4G-4, convert 4K video to MP4, MOV, MKV, FLV and 200+ formats, compress 4K ultra HD to 1080p/720p or lower SD resolution, change parameters like bitrate, frame rate, aspect ratio etc., and edit videos as you like. Step 1: Free download the 4K HEVC video converter on Mac or Windows version on PCs, and launch it. Then click + Video to load the 4K h265 video you want to transcode. 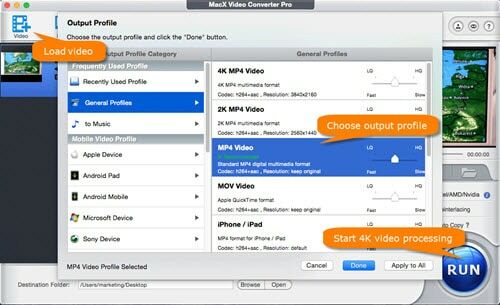 Step 2: Choose General Profiles > MP4 Video (h264+aac) > Done as the output profile, so that you 're able to watch 4K video on El Capitan, Sierra or earlier and Windows 10/8/7/XP, or older computers, iOS and Android smartphones and tablets. Step 3: Tap RUN button on the lower right corner to start processing 4K video from HEVC to H.264. If your desktop is hardware enabled, the Hardware Encoder box will be ticked on automatically, which will boost your 4K video processing speed up to 5 times faster. While if it possible, more people would like to play 4K HEVC videos on Samsung, Sony, LG 4K TVs. But it's not that easy. There are mainly three sources of 4K HEVC content: through the online media apps, via offline 4K H265 contents like download 4K from YouTube, recording 4K HEVC at 60fps on iPhone X, iPhone 8/8 Plus, by official television signal, which is not available right now. Thus the requirements may be various for different sources. But basically, you need a 4K TV with a built in HEVC decoder, so you will not encounter any hiccups when playing HEVC-compressed 4k content. Meanwhile, the 4K TV should offer full HDMI 2.0 connectivity with many models, which is able to deal with 4K at frame rate up to 60fps. Other features include options for the Rec. 2020 color space, 4:2:0 chroma sub-sampling, up to 32 channels of audio, 21:9 aspect ratio, dual video streams, and improved 3D and CEC functions. Then if you would like watch 4K HEVC through smart platforms with media apps, make sure you have an internet connection at least 2MB/S, so that you can make use of streaming media apps and smart platform built into external boxes like Roku, Amazon Fire 4K TV box. Get a 4K 4K video processing tool to transcode 4K HEVC to widely compatible AVC/H.264. MacX Video Converter Pro is worth trying. It can convert video to 200+ formats, transcode 4K video among HEVC, H.264, VP9, etc., downscale 4K UHD to 1080p/720p, SD, and edit videos as you like. Failed to Play 4K at 60 FPS on Safari? Solve it Now!